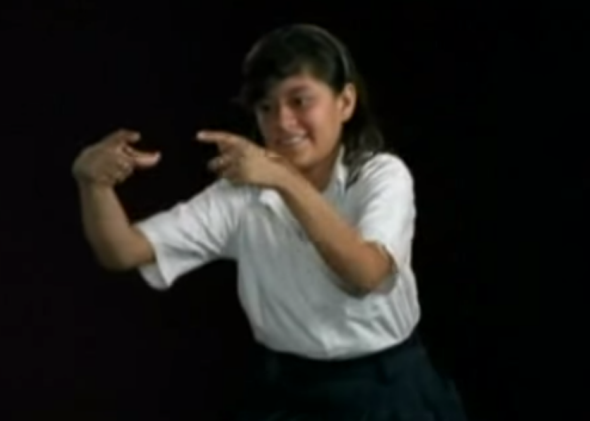 A girl telling a story in Nicaraguan Sign Language, which was created spontaneously by children from minimal linguistic input. Children learn the language(s) that they hear and see around them at a young age, but what happens if a child just never has any linguistic input, spoken or signed? Although a scientific study around this question would undoubtedly be fascinating, it would also be extremely unethical, so much so that the cultural historian Roger Shattuck has called it The Forbidden Experiment. In more recent centuries, we’ve discovered what happens when children are isolated from language through unfortunate circumstances. One example is “wild children,” such as Victor and Genie, who have been abused or neglected, but as interesting as those cases are, it’s hard to separate out the effects of language deprivation from other mistreatment. Another way that children may be naturally isolated from language is if they’re deaf children surrounded by people who don’t speak a sign language. Although their families often manage a rudimentary form of communication with them, known as home sign, it resembles the ad hoc gestures that we’d do at a loud concert and lacks the full expressive powers of a complete sign language. In Nicaragua in the 1980s, many such children were brought together in the country’s first school for the deaf, where especially the younger children took the various home signs of their classmates and stitched them together into a full-fledged sign language, as you can see in the video below: A clip from the PBS documentary Evolution: The Mind’s Big Bang. Nicaraguan Sign Language has been cited as evidence that although children require a certain amount of linguistic input at a young age in order to learn language, they’re capable of generalizing from incomplete information to something far richer and more complex—a testament to the magnificent potential of the human brain. *Correction: July 17, 2014. This post originally misspelled Phrygian.